Mustad TR78NP-BN KVD Elite Series 1X Strong Round Bend Treble hooks were designed closely with multiple Bassmater Classic champion and Angler-of-the-Year, Kevin VanDam, to deliver the ideal balance of hooking and holding power. KVD is known for power fishing especially when it comes to his two weapons of choice, spinnerbaits and crankbaits. When at a caliber such as KVD there the best equipment is used with the highest quality. The KVD Elite Series Round Bend Treble feature a 1X strong wire diameter and standard shank length. 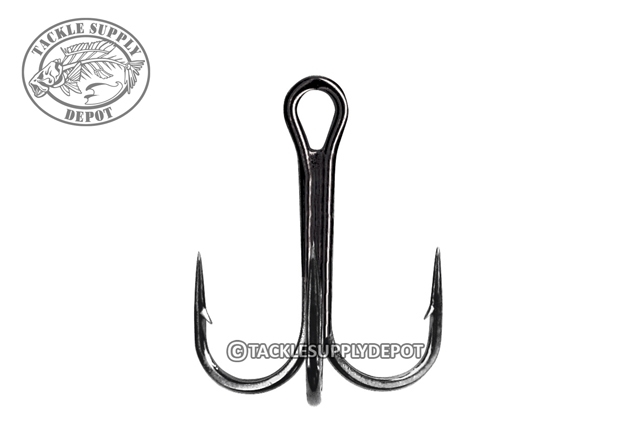 These hooks are a great choice for a range of topwaters, jerkbaits or other suspending baits. Where trebles with longer shanks help increase the distance between the hook point and lure body, providing increased hook ups these hooks also excel. Opti angle treble hook which features Mustad's 4.3 Ultra Point technology. Chemically sharpened high carbon steel and Nor-Tempered for ultimate strength. Coated with Mustad's all new Black Nickel that are 4 times as rust resistant as traditional Black Nickel.